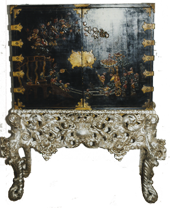 This silvered stand to an 18th century lacquered cabinet was covered with two layers of paint and old oil gilding. These layers were removed to reveal the remains of the original water gilded silver. The losses in the gesso were made good and the whole stand re-silvered in white gold.